New website is coming soon. In the mean time, check our Facebook page for recent project updates. Stone is timeless, evocative, and connects people to the earth. 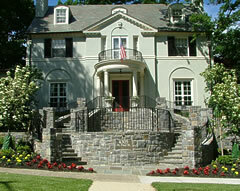 That's why so many discerning homeowners enhance their property value with natural stone. We have built our business on the merits of our stone masonry skills, which is the reason landscape architects love to work with us. There is a real art to working with stone. If you're thinking of veneering your home, installing a walkway, retaining wall, or outdoor living space, call us for a consultation. Fine woodworking requires true skill and craftsmanship. 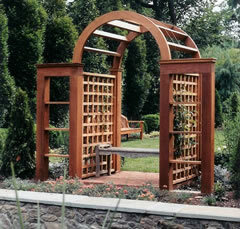 Our artisans can create a pergola, pavilion, arbor, a one of kind garden feature or even a wood deck to help you escape. Whether you are creating an outdoor living space or just enhancing your existing landscape, wood adds a boundless, natural touch. 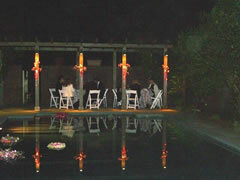 A well designed lighting plan can enchant, and make useful, any landscape at night. We use a "zone" approach to create subtle layers of light so you can safely escape in your own yard at night. If you ever come home with stress in your neck or back, consider adding the tranquil sound of running water to your outdoor living spaces. 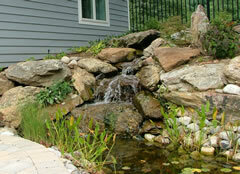 Water adds life, creates new gardening possibilities, and enhances the look of your property. We use Aquascape products because they are self-contained eco-systems, so you don't have to worry about maintenance. Nothing enhances your escape like running water. Don't get stuck inside—expand your living space into the great outdoors year around! Entertaining and relaxing will never be the same after you have a new pool or spa house, porch, conservatory, or outdoor fireplace and kitchen. We work with you to creatively design the best space for your house and property. A landscape feature just isn’t complete without a garden to enhance it. 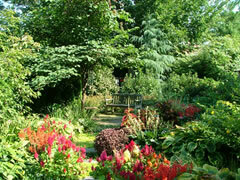 A garden with rich colors, scents and textures can create an atmosphere that elevates the spirit. We have nearly 20 years experience in the green industry. 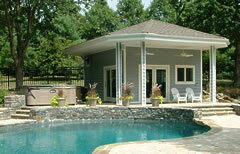 Let us create an enchanting space for you to "escape in your own backyard."